How I spent only $10 on my Halloween holiday decor! My favorite part about DIY is how much money I save. I know many single income families can relate to the $truggle. I have collected décor for each holiday/season over the past 7 years, but I don’t like to decorate the same year after year. So with limited budget and a desire for change, I have to get creative. I use what I have in my trusty holiday containers and combine that with things around the house, in our yard, in our cabinets, you name it. And usually there is a lot of spray paint involved. This Halloween was no exception. This year I got most use out of a package of scrap book paper I got from Hobby Lobby a few years ago. As you can tell, I have definitely gotten my moneys worth out of that thing! I can’t even tell you the name of it because it’s cover was ripped off long ago. But you can find scrap book paper anywhere, Hobby Lobby, Michaels, Walmart, you get the gist. So the first project I used the paper for was my homemade apothecary labels for my witch theme. This particular scrap book paper had lots of different options for faux labels. I simply cut out a shape I liked, then burnt the edges to give a weathered look. Please don’t do your burning indoors, like I did with the first label. I stank, my house stank, not to mention the fire hazard. It was a dumb move. I went outdoors to finish the rest. :-/When I was done with my pyromania, I wrote whatever I wanted on them and then used modge podge to glue them on. I think they turned out pretty good. Next I used a few of the pages for my dining table centerpiece. Other than tearing the paper out of the book and placing it on the table, there is literally no work involved in the DIY. BONUS!! My final scrap book paper project was my Halloween banner for the fireplace. I cut out triangles and flag shapes for the banner then used stencils and more paper to make the letters and numbers. I used some of my daughters leftover school glue stick to put the letters and numbers on. Like I said, on a very tight budget here. Don’t judge. I punched holes in each corner of the flags and use small strips of ribbon to tie little knots on each side. You can use any ribbon for this. Just make sure it’s wide enough so it won’t slip through your punched holes. Spray paint was the next star performer for my DIY Halloween. I use tree branches for a lot of my floral projects so I already had some good sized branches on hand. If you don’t have any, just walk out to your backyard, your neighbors front yard, the parking lot at work, whatever works for you. I picked out the ones I like and gave em a good coat of black spray paint. I used Rustoleum Gloss Protective Enamel because that is what I had at home, but you really don’t have to be picky when spraying branches. Really. 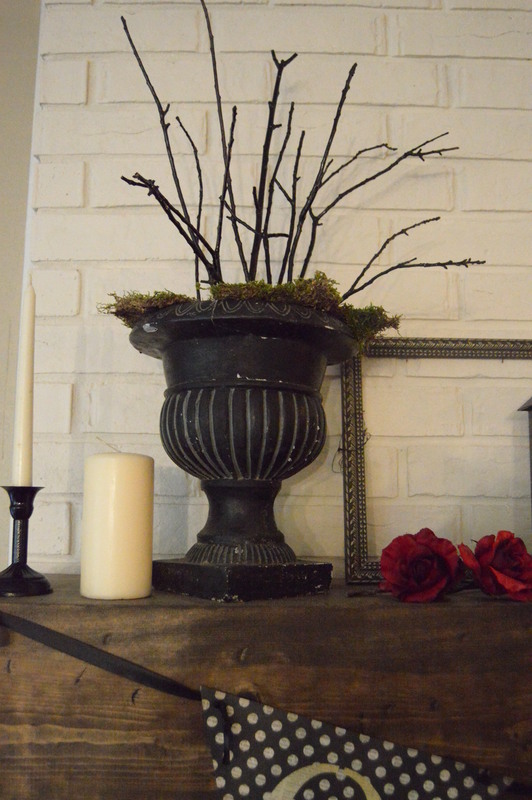 I stuck them in an old black urn and added some preserved moss. 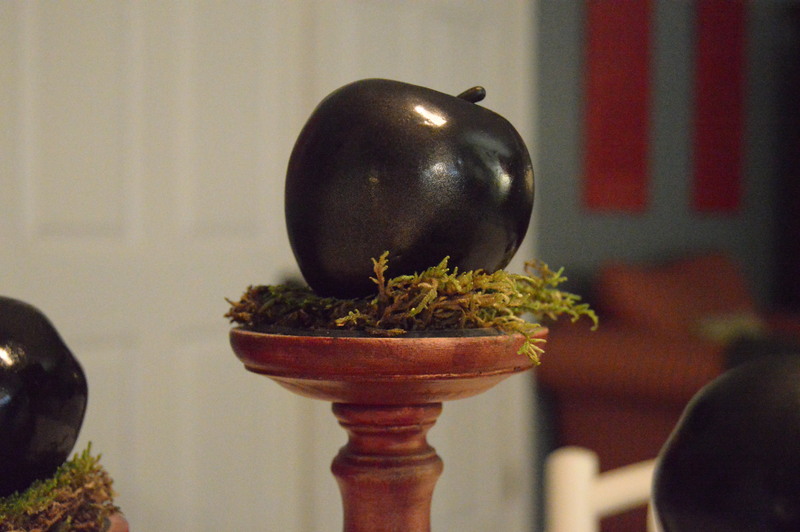 Next I had it in mind that poisoned apples would be perfect for a witch them. I have this set of gold faux fruit that I bought many moons ago and I hate them. I never know where to put them and my toddler likes to throw them around the house. They weren’t all apples, but I figure poison is poison right? So I sprayed those puppies down. 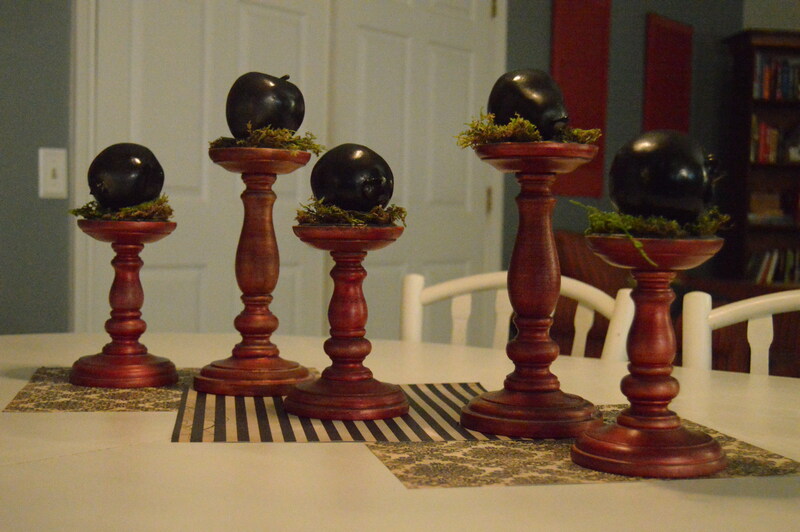 I placed them on red candle holders with a little moss and set them on my scrap book paper table runner. Finally I painted a couple of wine bottles I had lying around. To remove the sticky labels, I ran them under water and scraped them off. Once they are really saturated with water, they come off pretty easily. I used them in the apothecary. And that’s it! 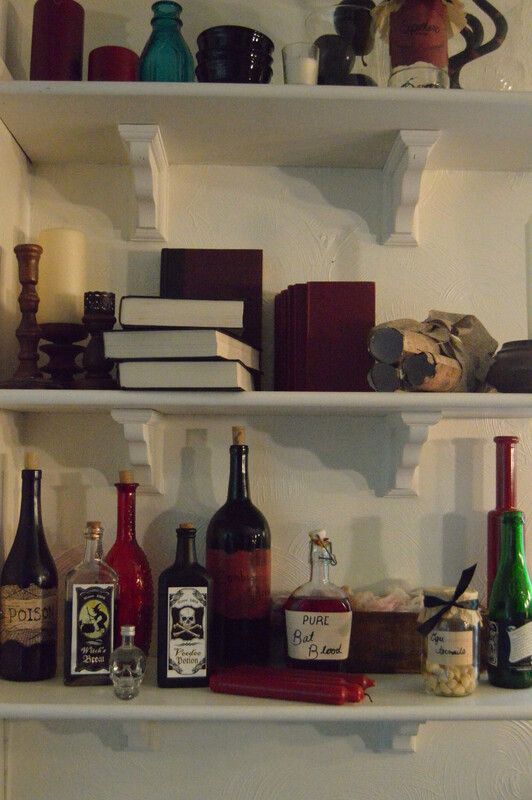 I pieced together a bunch of stuff I had at the house to create each of my vignettes. This is the extent of my Halloween décor purchases.